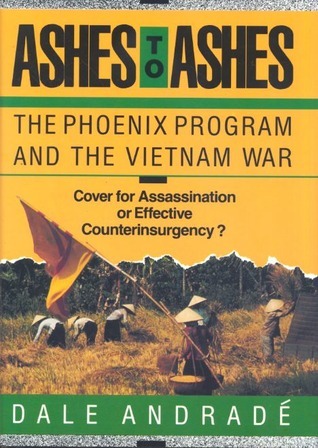 If you want to read a fair and accurrate description of Vietnam's Phoenix Program and its scope and activities then this is the book for you.Well researched and well written it is one of the few books that portrays Phoenix for what it was, a systematic program to counter the VC insurgency. Most books on Phoenix are content to waste space plathering on about mythic conspiracies by the CIA to assassinate and torture every living being within the country of Vietnam. Andrade's book tears away these myths and explains in full detail the situations leading up to the creation of Phoenix, its inception and planned scope, how it operated, and attempts to determine its overall effectiveness on the course of the war.If you are looking for an anti-US government, or CIA/military/Presidential/feemasons/illuminati conspiracy book then don't even bother. But if you are genuinely interested in knowing more about the truth of the Phoenix program, this book is a MUST. An additional item is that in reading this book you may be able to deduce for yourself how such a program could help our current efforts in Iraq. A very objective overview of the history of the Phoenix Program. I read this after reading Jeremy Scahill's book and it promptly debunked many of his points...which is kind of what I expected.